L'Accord Code 119, released in the United States in January 2012, was created for Caron by in-house perfumer Richard Fraysse. Its "striking yet intimate" composition includes notes of blackcurrant bud, Egyptian jasmine, patchouli, blackberry, black pepper, vanilla, heliotrope, musk and amber. It's one of several recent releases that seem intended to update Caron's profile while maintaining continuity with the house's heritage, which must be a difficult task for any century-old brand. This perfume is promoted as "the House's first fruity and floral fountain fragrance" and as "a bold yet deliciously sweet composition redolent of freshly-picked red summer berries with a rich, oriental woody base." Let's take that first quote first: surely Caron has offered fruit-and-flower blends before 2012? What about Acaciosa, with its pineapple note, or the citrus-topped Alpona? Well, it's the first Caron fragrance to employ berry notes, that much is true; and I do agree with that latter description. I'd call L'Accord Code 119 (or just Accord 119, as the bottle is labeled) a fruity-wood fragrance rather than a fruity-floral. To my nose, the most prominent notes in L'Accord Code 119 are the blackberry (particularly in the opening phases), the black pepper and the patchouli. The berry and currant notes are tangy and juicy just for a short while, and there might be a few soft jasmine notes blended into the heart, but the pepper and the wood and the musk keep things feeling grown-up and decidedly un-girlish. The blackberry lasts into the fragrance's later development as a wine-y, jammy trace as L'Accord turns increasingly peppery-woody. The patchouli makes a stronger appearance than I would have predicted for a Caron perfume; it's not a down-and-dirty patchouli, but it's not the sanitized patchouli note that appears in so many mainstream fragrances, either. After the fruity introduction, the whole thing ends up feeling smooth and linear and not too heavy. In some wearings, I even thought I detected just an edge, a penumbra, of the classic Caron oakmoss base hovering behind the fruit and spice and wood notes; at other times, I couldn't catch it, but I hope it's there, just as a trace of the Caron "DNA." This fragrance could easily be worn by men as well as women, although it seems to be aimed at a female audience. There's something slightly muted about the final effect — I wouldn't mind a bit more vibrancy, as well as a bit more longevity — but overall, I've enjoyed trying L'Accord Code 119. It's hard to talk about a blackberry-musk fragrance without thinking of a niche classic that I happen to love. And yes, you could imagine L'Accord Code 119 as the love child of L'Artisan Parfumeur's Mûre et Musc and Voleur de Roses, dressed a bit more conservatively than usual for a gathering at the Carons' house. As I wrote in my review of Caron Délire de Roses, I'm more than willing to let these younger guests join the party, as long as they behave respectfully towards their older "relatives." They may end up extending their "family"'s reputation to a younger set, after all, and as long as Caron also maintains its classics (Narcisse Noir, Nuit de Noël, Farnesiana, and the rest) and tries to keep them faithful to their original formulations, I'll be happy. Caron L'Accord Code 119 is available as 30 ml ($100), 50 ml ($165) and 100 ml ($240) Eau de Parfum. It is also offered as Perfume Extract (which I haven't yet tried), in various sizes. For purchasing information, see the listing for Caron under Perfume Houses. Note: top right image is PICT0530 by agnesgtr via Flickr; some rights reserved. 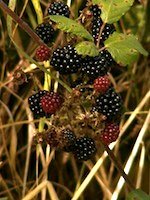 Maybe it’s the two days of sunny weather we’ve finally had this week, but blackberry sounds really pleasant to me today! Might have to seek this out for a try. I tend to eat more fruit in the summer, and to wear fruitier fragrances in warm weather, as well! Mure et Musc is a new classic! and it was my introduction to perfume beyond department stores, when my mother started wearing it in the mid-90s. Describing anything as “the love child of [random fragrance] and Voleur de Roses” is sure to get my attention! Berries generally aren’t that appealing to me in perfume, but peppery-woody I can do (and I do love Parfum Sacré, another peppery-woody Caron). Still, though, I wish Caron would worry less about updating its profile and pay more attention to the classics that established that profile in the first place. And I know that brands need to remain commercially viable and attract young’uns and whatnot, but still, a crabby perfumista can dream. Yes, we can dream! I don’t think it’s crabby, wanting the classics to stay in circulation. I’ll have to give this a try. Lalique’s Amethyst is my favorite comfort scent and is composed of black currant, blackberry, floral notes, musk and vanilla. This sounds even more delicious and probably ‘punchier’, especially since it has patchouli, not to mention the other wonderful ingredients. Jonette, if you like Lalique Amethyst, you will probably like this one, too… it’s woodier and more peppery, but it still has that sophisticated-blackberry feeling! DRAT! I just looked at the Caron website and it’s not even listed. I know that Jessica wrote that it was released in the US in January. Does anyone know if it is sold in Europe outside the Paris boutiques? Caron doesn’t have samples. Of course, now I want to try it more than ever! I’m in The Netherlands. Any ideas, anyone? Oh dear! I only know that it’s available at the Caron boutique and Bergdorf Goodman in NYC… but I’m not familiar with European points of sale for Caron. Hope someone else can chime in! It’s in stock at Les Senteurs in London. It sounds like this isn’t “just another fruity floral” frag, then? DandT, I do enjoy good fruity-florals — ones that feel vibrant and rounded, not just thin and sharpish-sweet. I’ve been enjoying L’Accord Code 119, but I’m still not sure why Caron is calling it a fruity-floral — its pepper and patchouli and wood notes are much more prominent than its floral notes! What a great review, Jess. You make this sound so appealing, and very much related to the “older relatives.” I will have to set aside my suspicions and give it a sniff. A! It’s an interesting release… because, in some ways, it does feel like something from L’Artisan Parfumeur or another contemporary niche line… and yet there’s *something* Caron-like lurking in the background! It’s definitely more sophisticated than the “hey! new/young customers!” fragrances launched by certain other high-end lines. Let me know what you think when you try it! Blackberry seems to agree with my wonky skin chemistry, and as much as I shouldn’t admit this, I am loving the sound of Code 119. Heck, I even enjoy fruity-florals that aren’t all sugar and fruit dessert-like, but such are hard to find. Once I land another job, I will definitely be ordering samples of this if I can find any. Oh, good luck with the job seach! I know how you feel. I do hope you’ll have a chance to sample this one, since you like blackberry notes! I have two Caron’s. I was made to buy it when Robiim or maybe another poster said they were wrapped up in a sweater and Farneisana. I blind bought recently got another but to me they smell the same. I WILL HAVE THE.BIGGEST BOTTLE ASAP, IM CHOOSING THIS OVER AMOUAGE OPUS VI, is that a wise choice? Oh! Well, I don’t advise *anyone* to blind-buy, of course… and I do love Farnesiana, and I’ve only tried Amouage Opus VI once and don’t remember what I thought… so I may not be the right person to ask, or else I’m not sure quite what you’re asking! Anybody, which one is more striking? Which one is the deepest and strongest? I’m glad you reviewed this, Jessica! I find it strangely attractive, though I don’t often wear fruit fragrances and I’m a patchouli phobe. It’s an unusual and beautiful blend, and I want a bottle!